So Maestia has been out for awhile now, and Clerics seem like a decent class to play. However, like in most games, theres two ways to play your character (at least). I get that high priests are healers, and dark priests are damage sources. Having played a cleric based class in other games, I am having a hard time choosing what to do. Currently in the game, we have Mages that can deal fire or ice damage based on player preference. Because this is a specified damage class, mages usually provide better spell damage while in a dungeon or while questing. Because clerics are either healing or damage, has anyone found that the damage done by a dark cleric can be equivalent to that done by a pure damage class (mage, assassin, etc)? Also, gear is usually an issue for hybrid classes. Typically game developers make a class and design items and equipment for their idea of the class' main purpose: ie, a cleric is designed to heal, so most gear is based on stats for a healer. Is there gear readily available and purposed for a dark cleric, or is that going to be another challenge players have to face while picking a hybrid class? Also, feel free to post items, skill combinations, skill preferences, stat choices and other things related to Cleric play. Currently, I am at level 54 and I have chosen to build my cleric around a combination of both the Dark Priest and High Priest. This has allowed me to excel in both PvE in PvP, at least to my standards. The main perks for the Dark Priest are not in its damage, but in its DoT and slow effects. This allows you to slowly whittle away at your opponents health while they are helplessly running slowly towards you (in the case of melee classes and mobs at least). Even if they do reach me, I am able to tank multiple mobs and hits easily with my healing ability. Gear is not an issue to me, as it seems that all the gear I have acquired from dungeons have an equal boost to both wisdom and intelligence on them. Although, I have been putting the majority of my leveling up stats into intelligence, my healing doesn't seem to be lacking much in strength. Regardless, my heals aren't as strong as full wisdom build healers, but they absolutely get the job done, even in parties. While on the subject of parties, a hybrid cleric is a nice addition to them. Granted you are able to multitask, a hybrid cleric is proficient in both healing and in dealing damage to mobs, plus our AoE cripple skill is a life saver in many situations. The only down sides are your healing power is slightly gimped, of course, but you will also be generating more aggro from mobs if you are dealing damage and healing at the same time, and healing aggro is already insane in this game. You just have to train your self mentally to not instantly heal your party as soon as you see someone lose health. Edited by Asonyu, 27 July 2012 - 09:58 AM. Hybrid cleric is both viable and effective. I play one and I do comparable dps to the top rangers and mages on the server. It's all about talent choices. Lava explosion is ridiculously powerful and every point you put in the duration increase makes it 40% stronger. As for how you build a hybrid cleric, it depends on what you want to do. For pvp you are fine with only getting 1 point in high priest to get blessed regeneration. The rest can be used to talent dps skills, like cast time on ignition of darkness. If pve is more your style I would suggest an aoe cleric that mostly ignores the dark priest tree. You can go up to Grace in the high priest tree for some on demand instant heals. With this you can solo the final dungeon(on normal) in under 10 minutes, or under 6 minutes if you have good gear(including aoe active maestones). Gear doesn't actually change much based on what class you pick. Just pick up gear with int, wis, vit, and possibly agi/def stats. I've been putting points into Wis first and then Int and Vit second. Usually its about 2/2/1 or 3/1/1 depending on how I feel at the level. So far, it seems to be pretty good and balanced. My friend was going with Int > Wis > Vitality and it didnt work as well. What I dont like about their skill point system is that in order to get something you want further down the tree, you need to spec into all the requirements. Perhaps its to help keep players somewhat equal, but its a little irritating. Asonyu mentioned that his spec is good for both PvE/PvP, but as anyone found a spec that is more or less better for either one (not both in the same build)? Im not a fan of PvE healing anymore after years of playing in that role, but I do feel at least self heals are very useful in any situation. Currently, I am at level 54 and I have chosen to build my cleric around a combination of both the Dark Priest and High Priest. Hey, if not much to ask, can you post or send me a pic of your skill treee? i was playing off-tank dps SnS warrior, but the magic atack based damage on mobs was a big turn off for me so i want to try out a cleric and yours seems pretty nice to play, is not like im going to make my priest exactly like yours lol, but i want a reference point to build my own. well thanks!! Here is a screen shot of my Talent tree as it is right now. It is by no means perfect, and I'm sure I have messed up slightly in places, but so far it has gotten the job done. The last 5 skill points I get I plan to spend into Lava Explosion. 1 Talent to get the actual skill and then the other 4 will go into the DoT duration increase. Edited by Asonyu, 27 July 2012 - 03:44 PM. 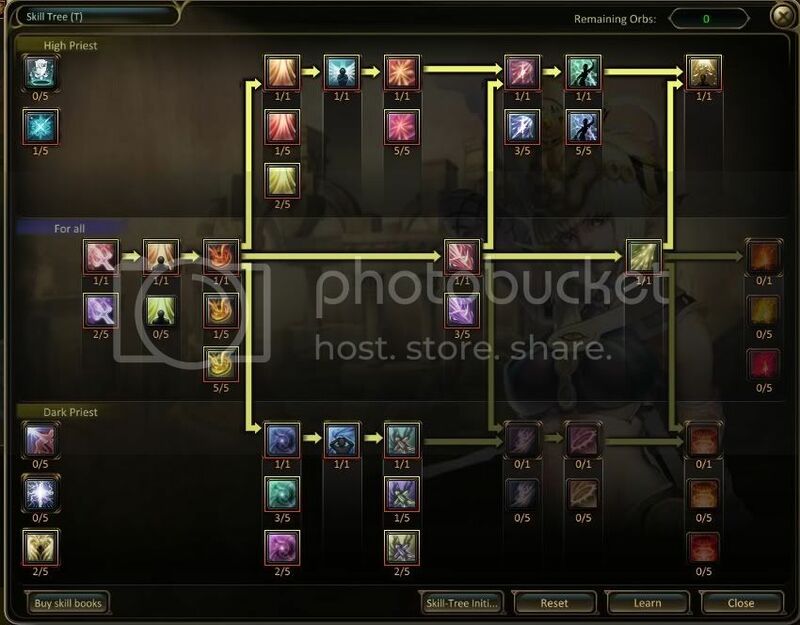 Nice skill tree, i thought a similar one for when reskill is avaible. If i aim to be a dark priest..will it be hard for me to solo dungeons? pretty sure you might want to have a build like his, with some defense and hp to be able to solo dungeons..
Feel free to add any tip or suggestion. Edited by RazorBz, 31 July 2012 - 05:29 PM. Hi all, there are new contents of the build? I can see that are new skill in tree. Nobody update build? I am pretty sure that the dark cleric is not pathetic because I know some excellent dark clerics who can solo a dungeon with just their guy. So, maybe their is a path that can be choosen that will satisfy us all. Just make sure you choose wisely or you will have to pay... money of course.